Having now listened to all three books in this series, I can now sit back and have a little contented sigh to myself. I have really enjoyed this trilogy and feel all the T's have been crossed and I's have been dotted. Jonathan Oliver's narration has been consistent and a joy to lisen to. It's not a deep and meaningful series by any stretch, but if you're looking for a relatively gentle listen, then I would recomend this series. Over the past week I've spent many happy hours listening to the trilogy and thoroughly enjoyed them. They were very well read and my first experience of audio books has been a very positive one. The final book in the trilogy brought everything to a close quietly and well. I’ve listened to all three parts of this long saga about the life and loves of Paul Craddock from 1902 to the mid 1960s at which time this final book ends. Paul returned to England in 1902 having been seriously wounded in the Boer War. After he recovered he, on impulse, used an inheritance to buy a farming estate in Devon and all three books revolve around his life as the local squire. This third book covers the period from 1942 to the mid 1960s and tells of war-time privations, deaths and social changes. Even more than for book two, I think to get the most out of this final instalment you need to have read or listened to the previous volumes. The back stories of the people who populate this final book are only cursorily referred to, but knowing their details makes for a richer experience and made me feel much more involved in their lives. As the chronicle of Paul’s life unfolds his children grow up and they in their turn have children and the emphasis of the narrative shifts to the trials and tribulations of the younger members. One of the strengths of this trilogy is how by telling the stories of the characters’ lives over the first 60 years of the 20th century the great social changes that occurred over that period are vividly illustrated. Others have commented on a similarity to the Archers in that the stories are a blend of the mundane details of rural life interspersed with dramatic, life-changing events both personal and national. I’m sorry that the saga has ended as I had become immersed in the lives of characters many of whom feature from the beginning of the trilogy. The narrator, as with the first two books, does a splendid job of dramatizing the text. I greatly enjoyed the book and it's a must listen if you have the previous two in your audio library but there is a sadness listening to the elders in the list of characters age. The whole book is winding up to a ending and there is a fair amount of repetition as facts from previous books are revisited and not always accurately. 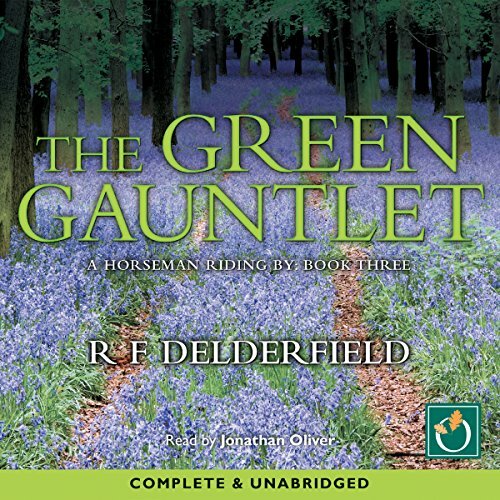 I will have to listen to book two again but felt there were some editing errors in this book, the pair's wives were said to have been expecting children in the last book but early on in The Green Gauntlet it was established that there had never been any. A lot of characters felt like they had been forgotten about, they had left the valley and suddenly brought back or written out in a reflection from another character or in a few lines. This story didn't fee quite as well written during the first part as new storylines were being established and less time given on the previous main characters. This is probably due to the younger generation of characters suddenly being forced to the fore of the story and not having had time to develop as their parents generation of characters had. There were a few things that suddenly popped out of nowhere or had been forgotten / changed from events in previous stories but as the chapters rolled by this book found its footing and drew me back in. Although written along time ago this is a classic and ageless trilogy, the cast of characters would be comfortable in any era, they are relatable and it is impossible not to care about them all. Sentimental but beware the author has a habit of disposing of characters no longer necessary to the plot and you are left wondering the fate of many minor characters. Moments of humour can be found amid the rather grime WW2 period. Well written sections of action and some very romanticised pieces about the Devon countryside. Suited my current mood and was overall enjoyable.